Update Friday: end of this week looking like a cooler shot from North: cold front to bring wet conditions across UK during unsettled Friday with jetstream dragging in colder northerly winds from Pole behind for weekend (after a mild-ish period mid-week as warm air incorporated into system). Not snowy or outrageous, just cooler for Reigate. SE could win out at weekend as a bright, showery regime is possible on this NW airstream. Also, a possible “chilly” snap early/mid-dec appearing on charts now but not a major winter event likely at present, worth checking back for updates. No US winter storm for us, yet! If this was July it would be all fine. The HIGH building from the SW sitting over the UK this week will do its best to deliver some nice weather but, for the SE especially, it “could do better” with some cloud and drizzle sometimes spoiling the potential for a glorious end to Autumn. Nevertheless, there will be predominantly calm light winds and dry weather this week so nothing to complain about and no wintry weather on the cards for us in the SE at least. 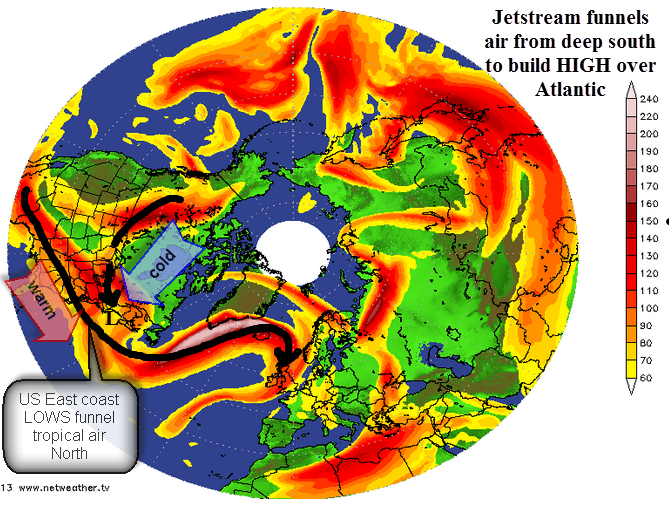 The south-east and Reigate sits in between a cold plunge over the East of Europe driven by a LOW drifting over Scandinavia and a HIGH to the SW of the UK driving upper air on a long circuitous route from the SW Atlantic, over Iceland and then down the N Sea. 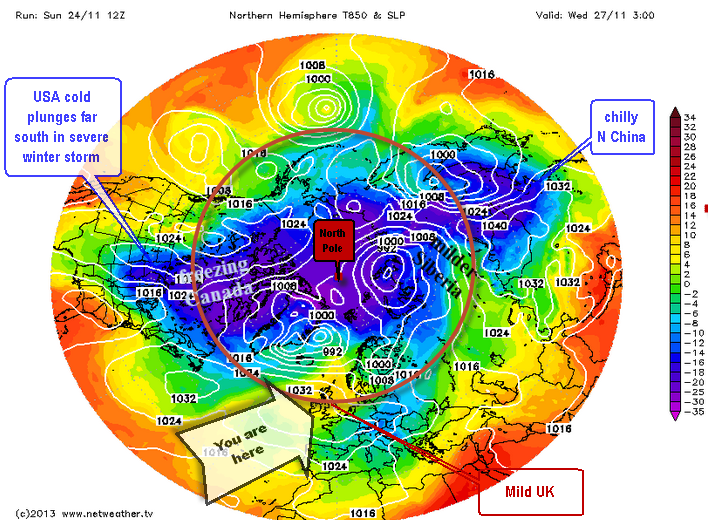 HIGH pressure sitting to the S and SW will build as a warm flow of SW upper air flows to the NW of the UK. This will, oddly, bring warmer conditions to the North of the UK initially than the South in the first part of the week. Initially a cool flow from the N and NE will keep the SE cool and with possible frost early in the week where temps will struggle to Tmax 6c and fall to freezing at night. Conditions warm through a little from weds onward and frosts become less likely as the warm air is stirred into the system and brings up temps day and night. It also delivers more humid air which usually means more cloud for SE rolling in off NSea. Later in the week the jetstream is predicted to pull down cooler air flow from the north again, especially for E and SE England and, whilst there is no risk of wintry weather for us, this will cause another dip in temps with a spell of wet weather spilling down on a cold front towards Fri / next weekend, though nothing out of the ordinary. It remains edgy but snow lovers will have to be patient, the air we are getting simply isn’t cold enough… yet!